29 November – 10 December 2010. Korean trade unions are deeply aware that climate change has become an urgent and alarming global issue. In order to prevent irreversible damages of climate change, we should not continue the way we produce and consume today. Korean trade unions strongly demand and hope that a fair, ambitious and binding agreement should be reached on the post-2012 mechanism with sufficient emissions reduction targets at the COP16 in Cancun, Mexico from 29th November to 10th December 2010. We urge all the governments to take responsible and positive actions at the COP16. Korean trade unions will also do their best to take an active role in tackling climate change at the COP16 in solidarity with international trade union movement and global civil society organizations..
Korean trade unions claim that developed countries should, on the basis of the principle of ‘common but differentiated responsibilities', pledge more ambitious emission reduction targets and provide developing countries with finance and technology for climate mitigation and adaptation. Especially it is unacceptable and unfair that developed countries do not commit themselves to more ambitious emission reduction targets on the pretext of a few big emitters among developing countries. Developed countries should take a first bold step and pledge ambitious targets reflecting their historical responsibilities for climate crisis. We think this is the way climate justice could begin to be realized on a global scale. Korean trade unions respect and support the spirit and agreement of 'the World People´s Conference on Climate Change and the Rights of Mother Earth', Cochabamba, Bolivia, 22 April 2010. Korean trade unions agree to and fully support ITCU positions that union representatives should be able to participate both in international climate negotiations and national social dialogue tables where crucial social agendas such as impacts of climate change and climate policies on employment and poverty are discussed. While emissions reduction policies ate expected to create green jobs, it could also lead to substantial changes in labor market and even job losses. We are fully in favor of 'just transition' and ‘decent work’ proposed and supported by ITCU and international trade union movement. We thus argue that workers, especially the socially and economically weak, should be protected in employment change associated with climate adaptation and mitigation policies. This principle of social protection should be applied at all levels from global arena such as the COP negotiations to national and local policy-making processes. We are concerned that international climate negotiations at the COP16 might concentrate too much attention on the solutions we think are unacceptable. We oppose the expansion of market-based approaches to emissions reduction such as carbon trading. The effectiveness of market-based approaches is uncertain and open to wide controversy. Moreover, these approaches may be reduced to only providing a new space for profit-seeking speculative capital. We are also mindful of the pitfalls and risks of technology-focused solutions such as nuclear power and carbon capture and storage (CCS). These technological solutions are fraught with uncertainties and risks and have not proved their effectiveness in reducing emissions. They may even turn out to be a barrier to developing a new and more comprehensive approach to the ‘system transition’ of the whole society to a truly sustainable green one. As an industrialized country, Korea is the 10th largest energy consumer in the world and the 15th largest economy in terms of GDP. Although being the 22nd biggest emitter in terms of total historical GHG emissions, Korea is not included in the Annex 1 countries. In terms of energy consumption and GHG emissions, Korea is no longer a developing country. We think it is unacceptable for the Korean government to demand a developing country status at the COP negotiations and to insist on a minimalist pledge of 30% emissions reduction by 2020 on a BAU (business as usual) basis. At the COP16 the Korean government should, as a member of international community, commit itself to emissions reduction targets duly reflecting its share of historical responsibilities for climate crisis. Trade unions in Korea, together with civil society organizations, demand the Korean government should pledge to achieve by 2020 more than 25% emissions reduction from 2005 levels. As mentioned above, trade unions in Korea fully support ITCU positions on climate change and thus call for the Korean government to support ITCU positions at the COP16 in Cancun (For ITUC positions on climate change, http://www.ituc-csi.org/IMG/pdf/COP15_TUstatement_Final_EN.pdf). As a global issue, climate change will have an effect on every corner of society and nobody can possibly avoid it. At workplaces and homes workers are routinely exposed to the impacts of climate change and will encounter and experience impacts of climate policies on employment and skills, among others. Workers are thus one of the key stakeholders in climate mitigation and adaptation policies and should be included as proper and competent partners in social dialogue and discussion on climate policies. However, true to its unparalleled hostility towards trade unions, the Korean government simply would not listen to the voices of trade unions on climate change and does not even provide relevant information about key aspects of national climate policies to trade unions and the wider public. We are very concerned about this. Even for successful and effective climate policies, workers’ participation and knowledge and social dialogue with trade unions are essential. At the COP15 in Copenhagen last year, the Korean President Lee Myung-Bak suggested that Korea would like to host the COP18 in 2012. The COP16 in Cancun this year will make a decision on who is going to host the COP18 in 2010. We strongly suspect that, if it is hosted by the Korean government in 2012, the COP18 might be used not as a respectable international arena to reach a fair, ambitious and binding agreement for the planet and humankind, but as a political expediency for the authoritarian President Lee Myung-Bak to win the presidential election in late 2012 for his conservative party. 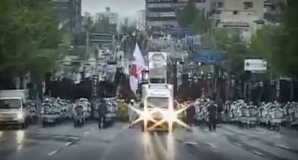 As widely known, the current Korean government headed by President Lee Myung-Bak is notorious for its unparalleled hostility towards trade unions and is the most repressive administration in this regard in the last two decades, as is amply documented in the latest ‘G20 Briefing Note on Korea’ published by international trade union movement (http://www.imfmetal.org/files/10101116193979/Briefing_Note_ENG.pdf). Moreover, the current Korean government has, since 2008, been unilaterally promoting and implementing the 'Four River Project' Initiatives which are, in fact, environmentally destructive and socially unsustainable massive civil engineering and construction projects on a national scale under the disguise of ‘green growth’ strategy. If it truly wishes to contribute to solving climate crisis as a respectable member of international community and to host the COP18 in 2012, the Korean government should stop the repression of workers and trade unions and honor its commitment to respect international labor standards and guarantee basic labor rights, and, most importantly, immediately stop the 'Four River Project' Initiatives and begin a fundamental revision of so-called ‘green growth’ strategy, which is anything but fair, green and sustainable.